Breakfast, it’s back just as promised. This time it is a “healthified” request. Because you can make those you know….you know that right? Send a recipe suggestion and I will try to create the healthy, real food version. First up, biscuits and gravy. I’m not going to lie, this is not something I would normally eat, not because it can’t be healthy but because it just isn’t my favorite thing. But I’m not going to turn down creating a new healthy favorite for one lucky reader out there (and hopefully more because you like biscuits and gravy….right?). Well the hubs apparently does because as I was contemplating posting this recipe I noticed he was licking his plate and that sealed the deal. Yep, there are people our there just like him who have to live in this health food bubble without any outside contact until one day the crazy food lady decides that she is going to throw a curve ball and serve biscuits and gravy. ->GASP<- He really never knows what he is going to get when he shows up. We can go from, what he would call a “girlie” meal to a man’s meal in 2.2 around these parts. So grain free biscuits gravy it was. My big concern was the looks. Let’s be honest, it isn’t the most appetizing food in the world. 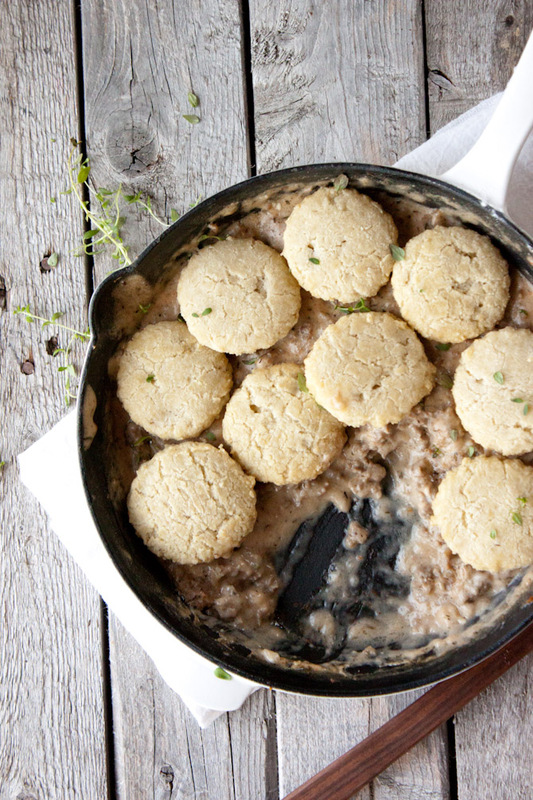 How do you take biscuits and gravy and make them look good? Your guess is as good as mine, but it all ends up in one place so for this meal I’m calling it a draw and this is as good as it gets. 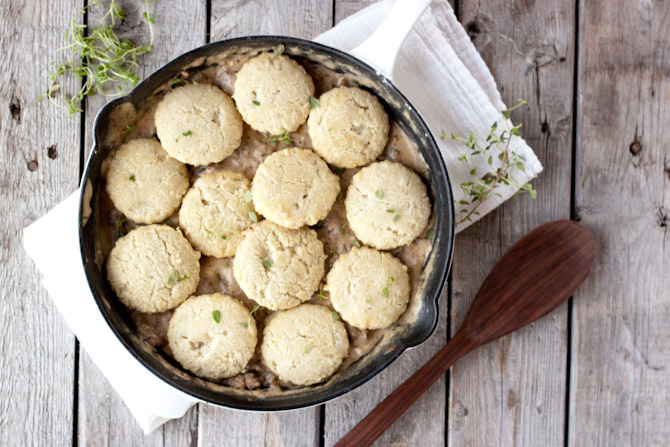 My recommendation, put the biscuits right on top of the not-so-pretty gravy to cover it up a bit before serving. It just seems better that way. And if you don’t care, I do, so put the biscuits right on top, mkay? The good news is, it tastes better than it looks. I always say, no to judge food by its appearance. 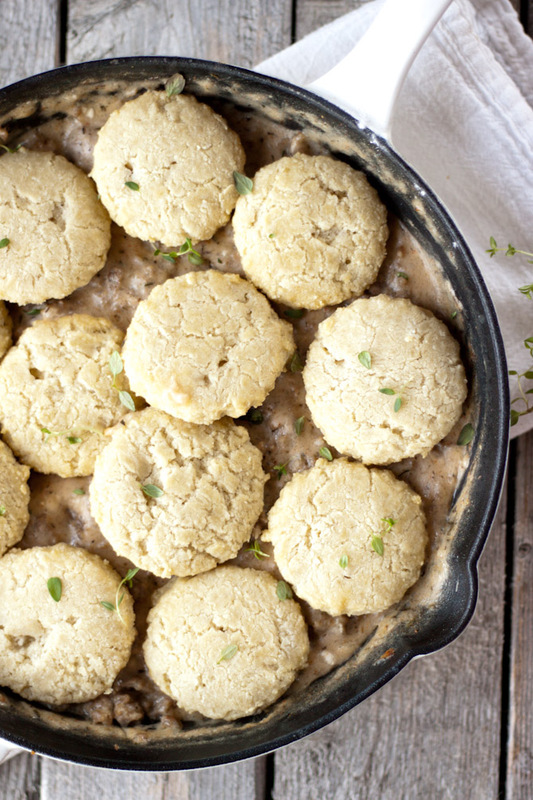 Sausage with a little kick and creamy gravy over these buttery flaky biscuits, what more could you ask for? More gravy? Go ahead, spoon a little more on. Do you have a recipe suggestion for the blog? I am taking them so leave a note in the comments or send me an e-mail. Can’t wait to help you live your food dreams. 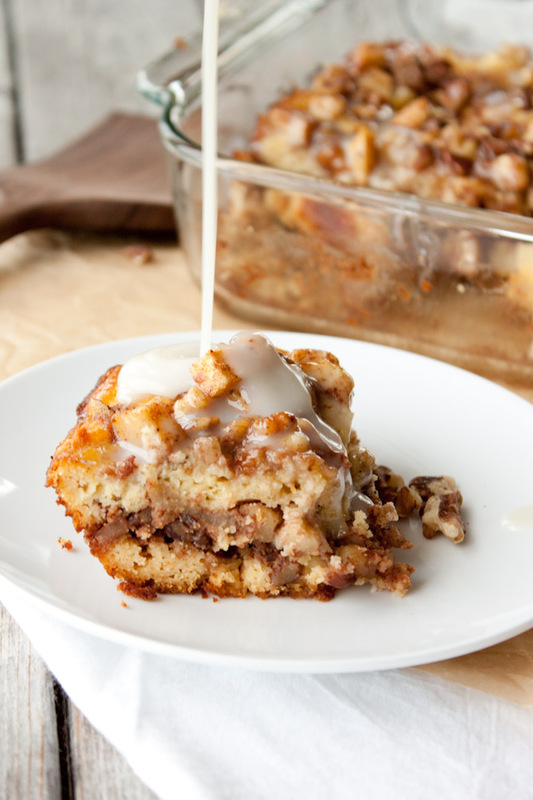 More breakfast is coming your way…of course after we take a dessert break. Someone help us…. Make biscuits and cut into small rounds. In a skillet cook breakfast sausage. Set aside. In same skillet over low-medium heat add butter, almond milk, broth, garlic powder, paprika, sage, salt and pepper. Mix arrowroot powder with water. Pour into gravy and stir until thickened (can increase heat if not thickening). Spoon gravy into a bowl and top with biscuits.